When I started as a children's librarian a few decades ago the world of storytelling seemed totally new to me. 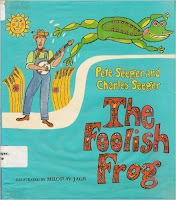 Later I realized it wasn't, because I grew up listening to Pete Seeger records, and although I liked his songs, it was the stories that really captured me: "Abiyoyo"..."Sam the Whaler"...and this one, "The Foolish Frog." It's kind of daunting to tell a story that you grew up with, especially when it's told by such a great teller (who also has a banjo). But fortunately the best stories work with all levels of tellers. And although I have no banjo, and don't sing well, I do have some puppets, and that's the way I first started telling this story in storytime. It starts with a farmer watching a Bullfrog jumping across a creek. I narrate and act as the farmer, with the Bullfrog puppet on my hand. 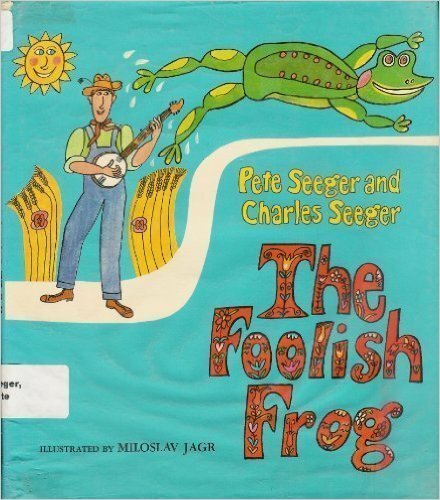 The Farmer makes up a song about it: "Way down south in the Yankety-Yank / A bullfrog jumped from bank to bank / Just because he'd nothin' better 'fore to do..." You can get the tune from Pete Seeger's version. I'm no singer, but this is simple, silly, and has a strong rhythm, so anyone can sing it just fine. The Farmer sings it to the folks at the corner store, and that starts the pattern. When I sing the song the second time, I usually ask the audience to join in, which sets up the silly sing-alongs that come later. Since all the men are at the store singing (and drinking Coca Cola (I think the book switched it to "strawberry pop") and eating soda crackers), the wives come to look for them (gender stereotyping I know, but it works fine in this story). That's when I get the Woman puppet. She sings the same song. Then it's the kids who come down to the store (and I use one Child puppet). It's fine to skip Woman or Child to save time, which I typically do because it can be a longish story...but if I do have the time I use them all. Next it's the Cows. Like Mr. Seeger does in his telling, it's fun to have each newcomer wonder aloud to the audience where everyone is, to give each a bit of personality and silliness, and also build the anticipation. 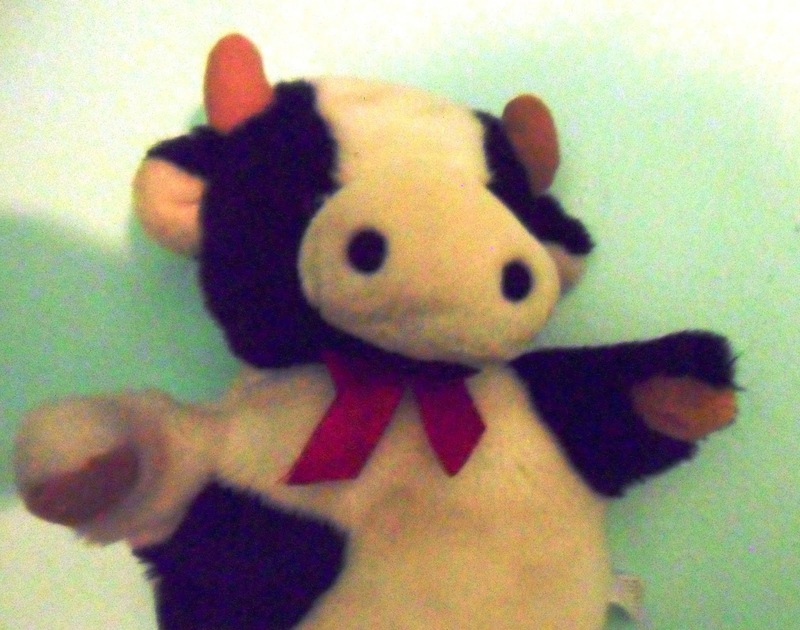 When the Cows sing along, though, they say "Moo-moo, moo-moo, moo-moo-moo..." to the same tune. This is a fun moment, when the audience realizes this is a much-silllier-than-usuial participation story. Next come Chickens, though I sometimes also skip them to shorten the tale. 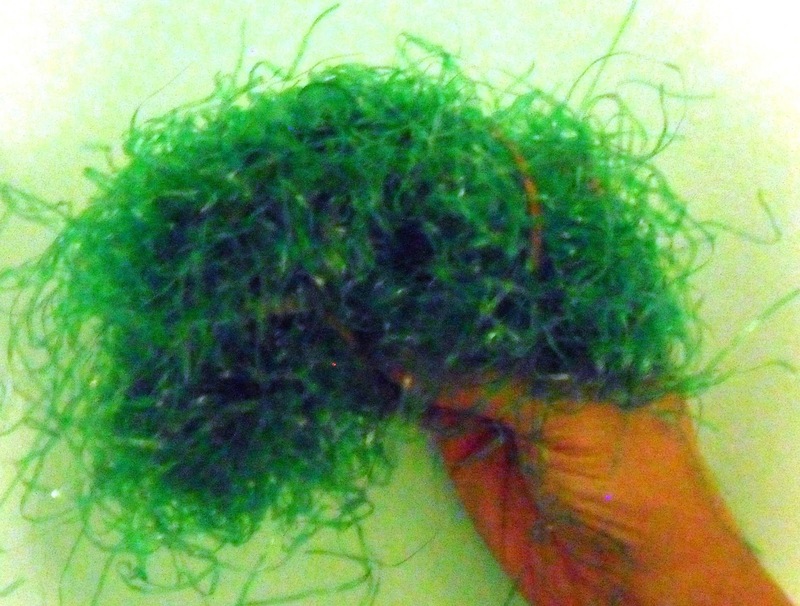 Then there's another clever shift, from the mild silliness of animals singing, to the really crazy silliness of other stuff, like the Grass wondering where everyone went and swishing its way down to the corner store too. For Grass, I don't use a puppet, just hold up a handful of Easter grass and move it around like a puppet. The song there is "Swish-swish, swish-swish, swish-swish-swish...." Barn is pretty fun too: I sometimes skip it, but when I've had a toy barn of about the right size, I pull that out and we all "squeak" the song like a barn door. For the River, I use a half-full water bottle and shake it around while everyone sings in bubbly voices. 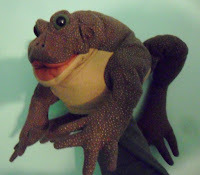 The final twist brings us back to the Bullfrog, who wonders where the creek he was jumping across went. He hears everyone singing about him, "puffs himself up with pride," and puffs himself so big that he explodes. I've thought about trying to actually make the Frog bigger as he puffs himself, but I think of this as really more of storyteller's version than a puppeteer's, so don't feel the need to visually represent everything. When he explodes, I grab as many of the puppets and props as I can and toss them up in the air. 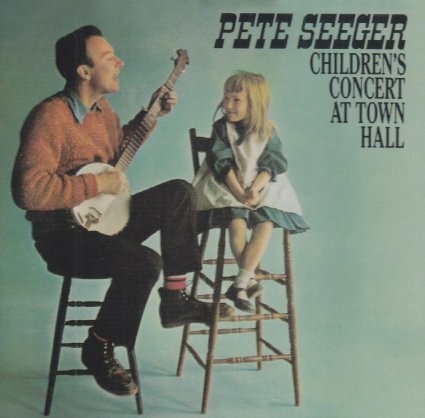 And Pete Seeger has a great ending for the tale: Nobody can find the Frog, so "all that's left of the Frog is the song...and we might as well sing 'er one more time." Which gives the audience one last go-round, this time with the words restored. 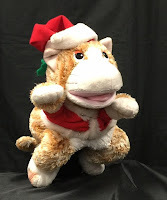 We needed a new holiday story to go with our annual puppet show presentation of The Nutcracker, so Brad and I decided to try Here Comes Santa Cat. 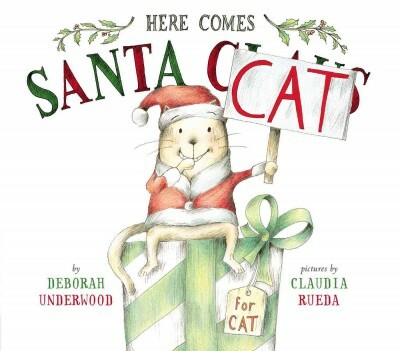 In the book, the "narrator" is talking directly to Santa Cat, who responds by holding up signs. Very clever and fun! We considered using the projector to show scanned images, but decided the act of Cat physically holding up the signs was really the heart of the book. So we scanned some pictures, laminated them, and taped them to paint sticks. For Santa Cat, we just squeezed a puppet cat into a little Santa coat and hat. Probably just having a hat could work, but the coat did help with this particular puppet. From in front of the stage, Brad interacted with Santa Cat. When he asked a question, like "Why won't Santa bring you any presents?" 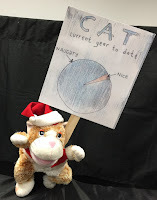 Santa Cat disappeared below, then popped up holding a sign. The sign is a pie chart comparing "naughty" to "nice," which is pretty funny, but most preschool age kids won't get it just from the visual, so Brad's reaction helped to explain it: "Oh, you were mostly naughty this year [point to blue part], and only a little bit nice [point to pink part]." That's the pattern we followed for the most part, but we also mixed it up with some other props besides the signs. Santa Cat was silent for the whole thing, except for a couple of bursts of singing, as when he decides to sing Christmas carols and meowl's horribly to the tune of "Jingle Bells." We also did some substituting. 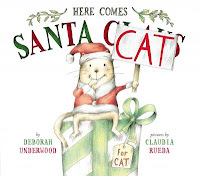 In the book, Santa Cat is asked how he'll travel like Santa without reindeer, and S. C. tries a rocket. Lacking a convenient rocket prop, we switched it to a Bullfrog, and the visual of frog and cat slowly hopping across the stage was pretty funny. Then when Brad reminded Santa Cat that he had to fly. we had a puppet Bird grab S. C., fly above the stage, and drop him. In another scene from the book, Santa Cat tries going down the chimney....we just skipped that one for brevity and because we couldn't think of a simple way to replicate it. Santa Cat brings up the Christmas Tree sign. Then disappears below stage, makes crashing noises, shakes the stage, meowling to the tune of "Oh Christmas Tree," and reappears tangled in Christmas lights. 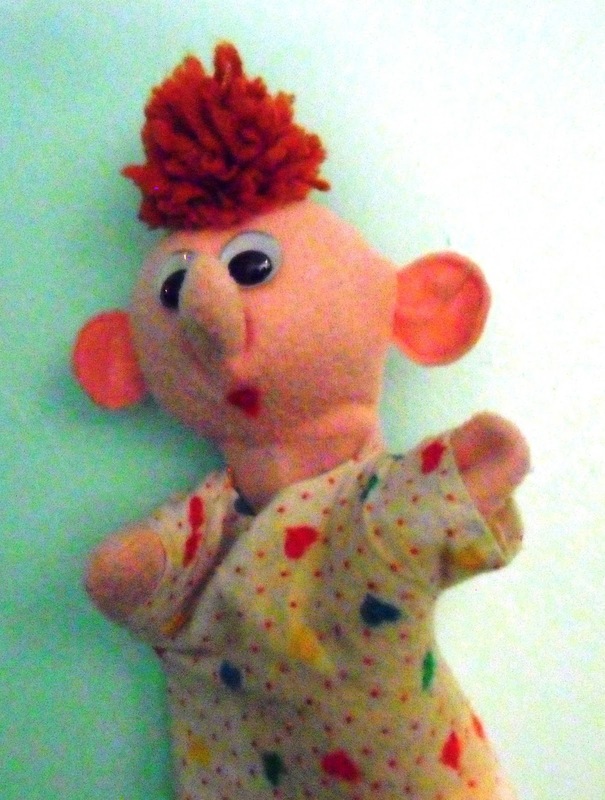 The book's ending is very satisfying, and worked well with puppets. 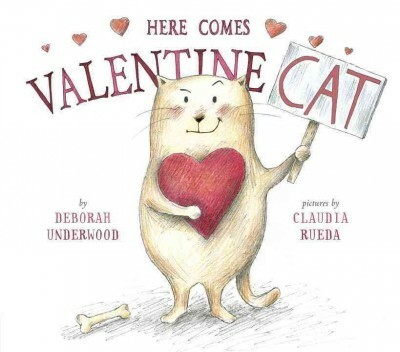 The narrator decides that Santa Cat has been trying to be nice, so gives him a present. We used two cans of cat food. Then a Kitten appears. 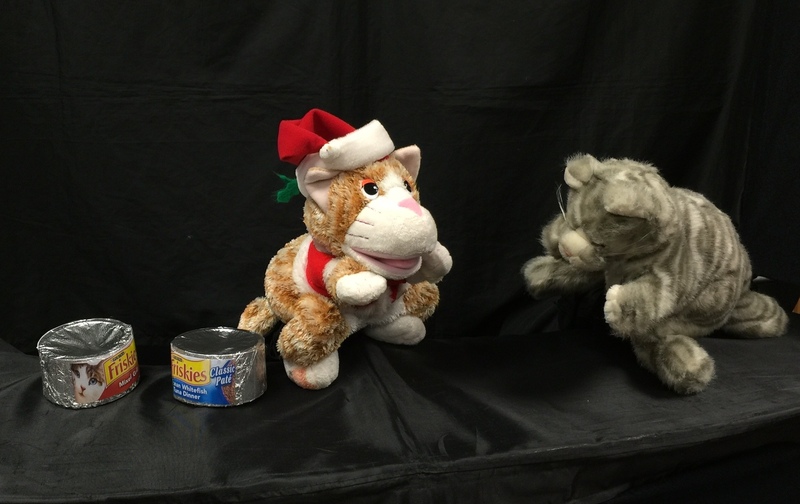 There's a little back-and-forth as Kitten shows interest in the cans and Santa Cat fends her off, until finally Santa Cat pushes one of the cans over to Kitten in the true spirit of the holiday.